The Kroton Option entitlement provided by Kumul Petroleum Holdings Limited (KPHL) has not gone down well with most of the landowners (Beneficiaries) of the five respective provincial government including Hela, Southern Highlands, Central, Gulf and Western Province. KPHL through its Kroton options states that the UBSA provides for the beneficiaries group to be given a commercial option for 25.75% shareholding in Kroton No.2 now called Kumul Petroleum (Kroton) Limited. Furthermore, the Kroton which is also known as Kumul Petroleum Holdings Limited holds the state 16.58% in the PNG LNG Project and the options, under clause 6.1 (a) of the UBSA, is for an undivided and fixed 25.75 shareholding in Kroton as a result of which the beneficiary group will have a direct interest estimated in the UBSA at 4.22% in the PNG LNG Project which is now 4.27% after redetermination. 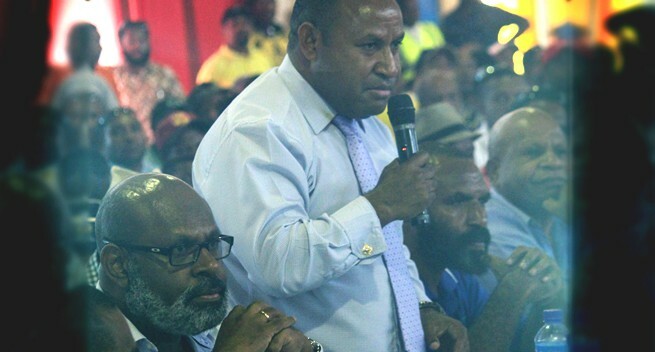 In a meeting called by KPHL last week at the PNG Institute of Public Administration and School Government hall, many landowners viewed their concerns over what they said several of their concerns need to be heard and met before the Kroton options is exercised. KPHL has discussed in detail of its subsidiary known as Kumul Vendor Note where it will work as a financier to help all beneficiaries to buy the 4.27% additional equity by or before 31st of December. However Landowner leader and President of People's United Assembly Party (PUA), Mr Raymond Kuai said KPHL was not a party to the UBSA 2009 between the State and the Beneficiary Group and KPHL is not the owner of the asset called the 4.27% additional project equity. KPHL under the Vendor Note would be just a "middleman" raising finance through vendor financing for the Beneficiary Group but at huge costs with neglible returns. Mr Kuai further said KPHL has little or no idea whether the 4.27% additional equity is direct or not, hence must stop misleading the public. KPHL managing director Wapu Rodney Sonk said the UBSA 2009 issues including the State as the owner of the 16.58% LNG project Interest and agreed under NEC decision No. 137 of 2016 to sell-down a 4.27% of it for the Beneficiary Group to buy on commercial terms as agreed under the UBSA 2009. Furthermore he said the initial rate of the purchase price agreed under UBSA 2009 is at $240m per 1% share has now be reduced to US150m per 1% share by a recent NEC decision. “KPHL through the Kumuls Vendor note is providing options to the beneficiaries however it is their choice whether to accept or not,”Sonk said. According to the landowner leaders who attended the meeting, KPHL is one of the entities advising the State in this case to raise financing through the vendor note. Sonk said with option exercise date looming at 31st of December this year after postponing it twice between January 1st and 30th June, 2016 and if not exercised by the last date of this year, the option will lapse in respect of any Beneficiary that has chosen to exercise its option. However, he acknowledged that the State must conduct the clan vetting process in order for them to receive their long outstanding benefits in royalties and equities. It is the duty of the State to finance the ADR mediation process headed by Justice Ambeng Kandakasi so as to enable all landowners along the LNG Project footprint to acquire the 4.27% additional equity as agreed under the UBSA 2009. Without a proper clan vetting process being conducted independently by the National Court sanctioned committee, no landowner will be identified at all. This is totally unfair. Kuai, a landowner of PDL 1, Arua clan and PDL 8 , Block 1642 and also the leader of PDL 9, Himiya clan said most of the landowners recommendations that were suggested and confirmed by the participants at the meeting include the State to suspend or rescind the subsequent NEC Decision which gave KPHL the Vendor note as it interferes with or runs against the spirit of NEC Decision No.137 of 2016. This must be done by or before 30th November 2016. The Beneficiaries expressed that the ADR mediation team to complete clan vetting processes for the entire LNG Project footprint (PDL areas, plant site and pipelines) landowners by or before 30th November 2016. The landowners noted that the ministerial determination and gazettal notice of the ILGs be published before 1st December 2016 and the State and the Beneficiary Group may conduct review of the UBSA 2009 if the National Government so wishes. The review if conducted would give clarity around what is "on an undivided and fixed basis" for the acquisition of the 4.27% additional equity, including whether the additional equity is direct or indirect and further explain why there is an express requirement in the UBSA for the 4.27% additional equity to be managed "by an independent corporate trustee". Kuai said these were many of the recommendations made by the landowners and if the State cannot meet the 30th November 2016 deadline for the ADR mediation process to complete the clan vetting process, it shall extend the Equity options due date of 31st December 2016 to a later date until such the State fully discharges its obligations under the UBSA 2009.